24 sts & 28 rows = 4” in St st. I used about 38g of handspun that Fyberduck created for the hat. While we determined it was a light worsted weight yarn, because it was a thick and thin ply, the fabric was a bit too lacy when knit at lower gauges. If you choose to use a commercial yarn for this pattern you will want a fabric that is sturdy but not stiff. The gauge is the most important factor. There is a list of possible substitutions at the bottom of this post but you might find other plump sport-weights or some light worsted-weight yarns work just as well. When in doubt go with a heavier yarn because it will fit a baby at some point in their life. Cast on 5 sts on DPNs or circular needle and k 5 sts. At the end of the row, slide the sts to the other end of the needle and pulling the yarn around the back, k the sts again. You’ve completed one row of Icord. Continue in this manner, pulling down on the cord occasionally as you go, until the cord is approximately 20” long. Break yarn and thread through the last row of sts, cinching them up tight. With your needle pick up K 90 sts creating 1 st in each of the rungs from the ladder starting about 2½ inches from one end of the I-cord. If your sts are off-center when you fold the I-cord in half), do not worry because you can always pull off or add the first few sts at the beginning. Just make sure to end with 90 sts total. Row 1: *kfb, K 19 sts, skp, k 1, k2tog, k 19sts, kfb *. Repeat between the * to the end of the row. Repeat Rows 1 – 2 once more. Rnd 1: *kfb, K 19 sts, skp, k 1, k2tog, k 19sts, kfb *. Repeat between the * to the end of the row. Rnd 2: pm to mark start of the rnd and join stitches in the round (being sure not to twist the stitches). K row. Alt row 1 with a K row until you loose the will to live which, coincidentally, measures about 5” from the I-cord edge. 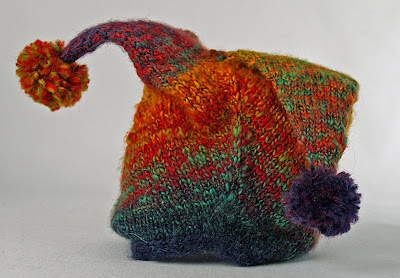 Fold hat in half with adjustable ties in back, PM, and K the first stitch in the row joining it in the round. Continue in this manner by decreasing 4 sts every 4th rnd, until there are only 5 sts left. Break yarn and thread through the remaining 5 sts cinching them tight to secure. Return remaining sts to needle(s), PM to mark beginning of rnd, K 4 rows. Continue in this manner, decreasing 4 sts every 4th rnd, until there are only 5 sts left. Weave in ends. Add pompoms to the ends of your hat points or tassels. Decorative buttons are cute too. Go wild; the hat isn’t meant to be serious and the only time one can wear such ridiculousness if they aren’t in the theatre, is under the age of 3 and over the age of 83. For lots of color Scotia Silk, Great Big Sea, or Blue Faced Leicester DK are nice. 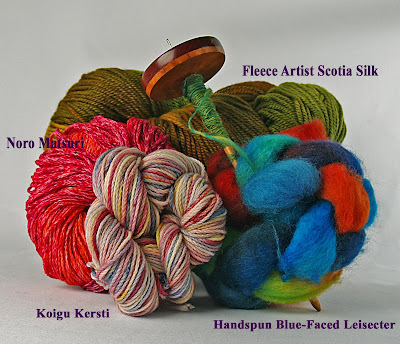 Koigu Kersti is a fab choice as well. If you want transitional color, try Migrations, Mitsuri, or Silk Garden. 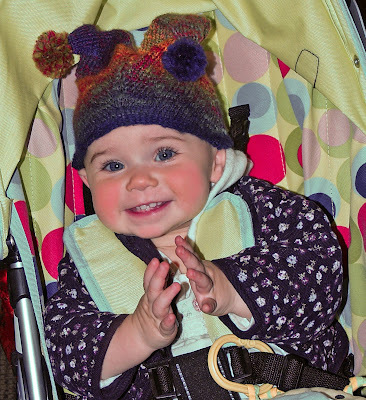 You could try a plain hat too or one with stripes out of Balance or Sublime Yarns Extrafine Merino Wool too. The post Gratis Knits: Spring 2008 appeared first on Knit Purl Blog.